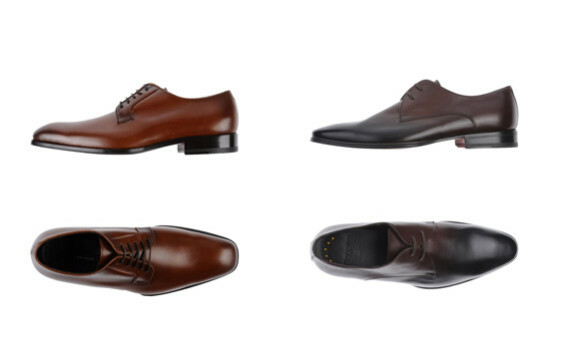 About a month ago I’ve posted a Simple shoe classification – a comprehensive guide for identifying men’s classic shoes. Today I’m about to extend it a little. And firstly I am going to talk on a topic of a toe style. 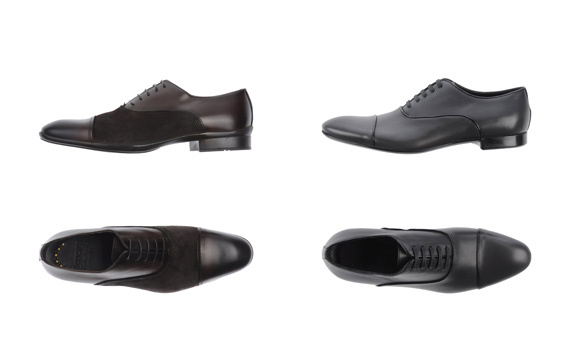 There are 5 basic toe styles each of them imply different degree of formality. Have a look at the table below that shows what each one is about. 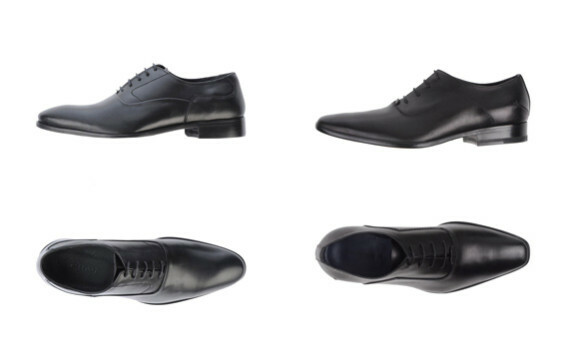 Most classic and versatile are captoe and plain toe shoes, they are suitable for any attire and could be found on vast varieties of styles. A grade down are Moc (Apron) and Bicycle toes. They are mostly used in semi-dress foot wear, on those occasions where shoe discipline is not so crucial (think relaxed Friday lunches). 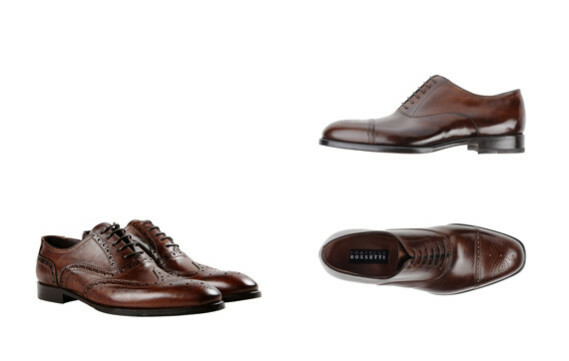 And at the last comes Wingtip toe (my favourite one at the moment) which is most often worn with a casual style. Wingtip shoes usually have brogueing (perforations) as decoration. All perforated shoes are brogues either they are oxfords or derbies. 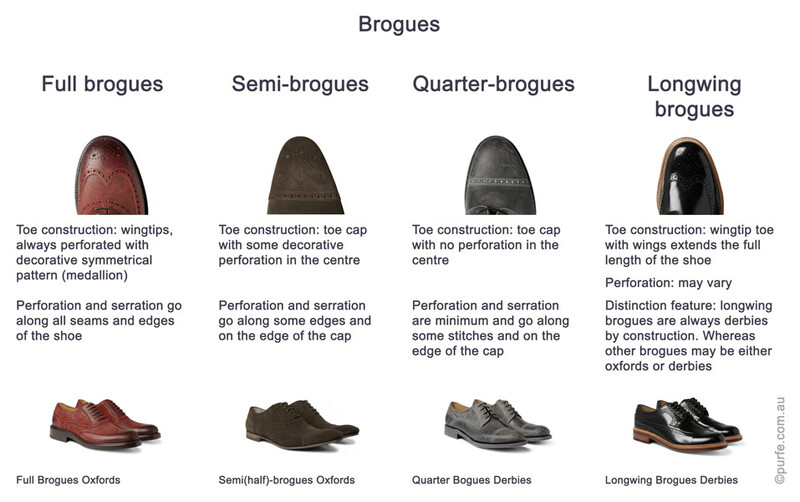 By the amount of perforation and toe style brogue shoes themselves divide into 4 categories. 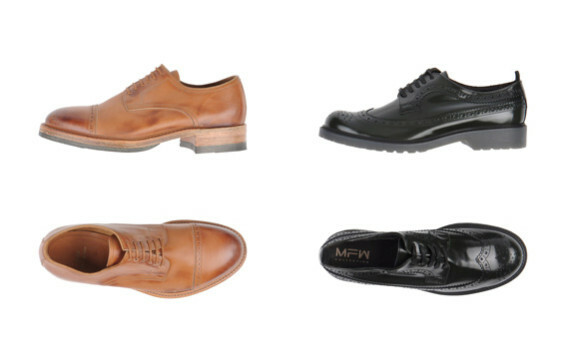 If oxford full brogues or semi-brogues have wingtips and cap toe (and sometimes the lace panels) in contrasting tones we can tell they are Spectator shoes. 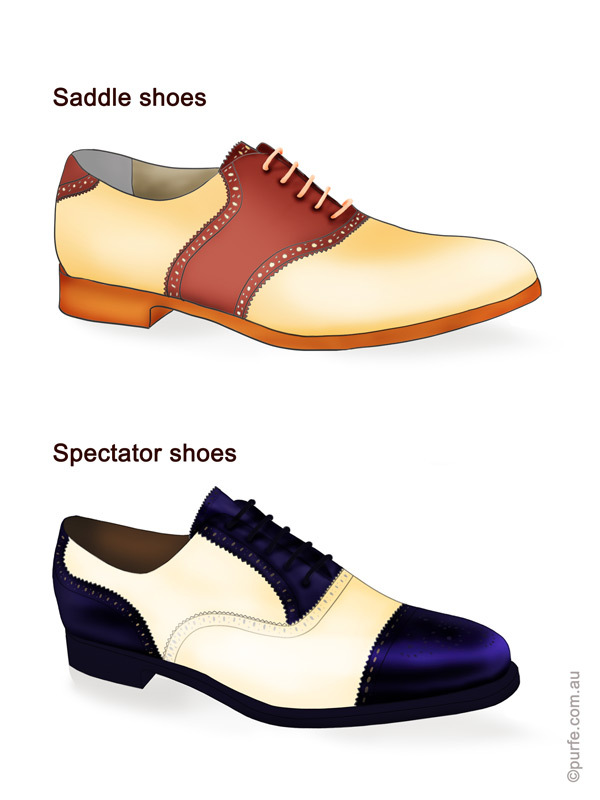 Not to be confused with another 2-tone low-heeled casual shoe – Saddle shoes! These are usually plain-toe oxfords made in white or tan leather with a darker saddle-shaped piece sewn across the mid foot. 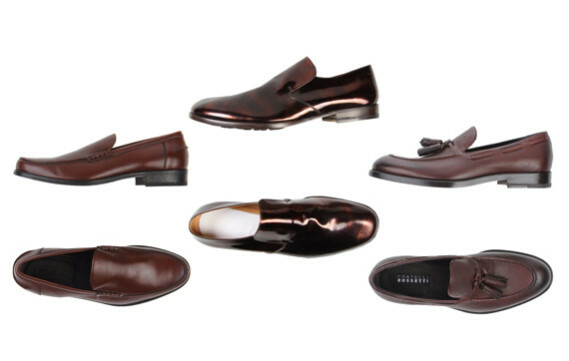 The “Saddle” part is traditionally black, brown or red, although who could really stop shoemakers doing something new? 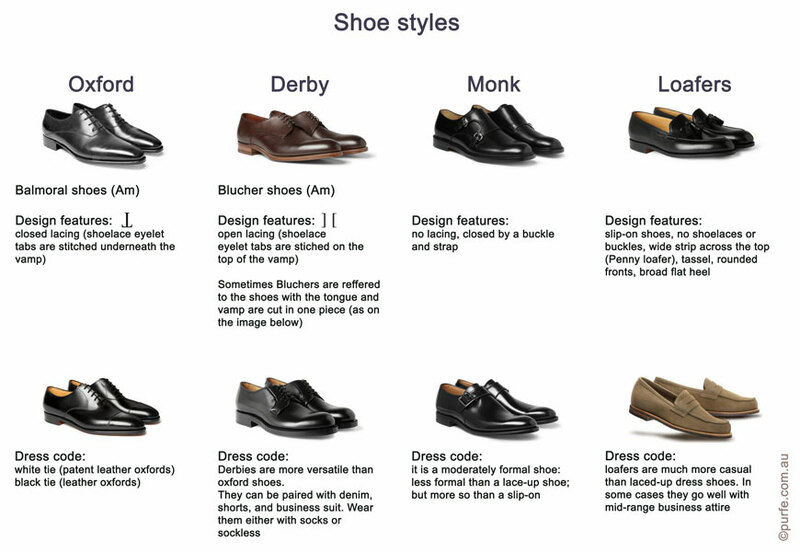 Well, I have expanded original Simple shoe classification a little bit to cover almost all types of men shoes by now. Hope you find it useful. And remember, they say you can tell personality of 90 percent of all the people just by looking at their shoes. So, it could be even a psychological tool for those who master it. On the pictures below there are some models from selected e-stores just to illustrate the idea and give you a hint what to look for. My recent post about relations of peplum and pants has touched an important principle of an outfit layout – the subject of a focal point. 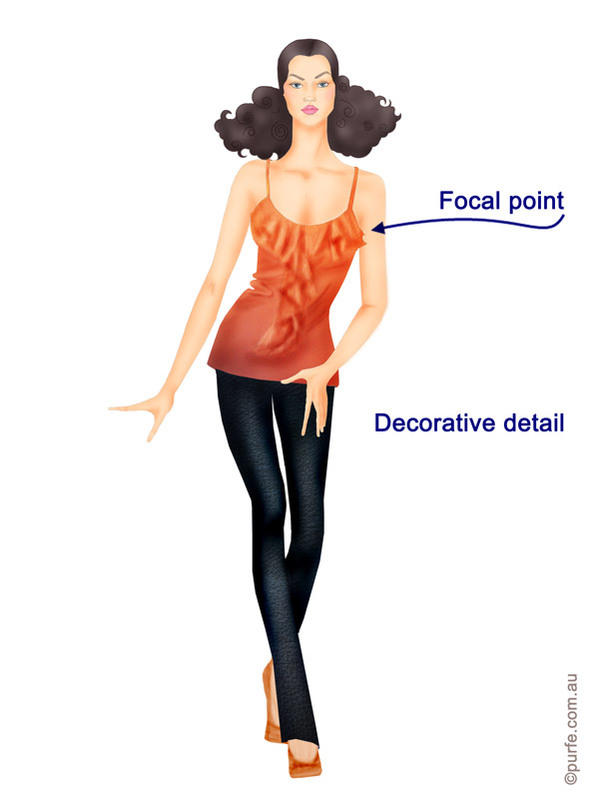 In fashion, like in art, focal point (centre of interest) is where the viewer attention is naturally attracted. Proficient arrangement of focal points can turn a plain outfit into a good one. It is a sort of visual magic when a scarf thrown over a shoulder resuscitates the entire look. The question is how do you know what trick to use where. Every garment independently of the outfit has its own centre of interest – it could be a collar, a pocket, a yoke, pleats, gatherings, you name it. On the image below the shirt catches the eye and it is the focal point of this look. But both skirt and blouse has their own centres of interest – it is a slit and a yoke respectively. -by complex trimming or other striking elements. The number of centres in an outfit can vary from one to as many as desired as long as they are hierarchically coordinated. Multiple focal points add interesting complexity. The diversity and elegant balance of details get attention of viewers. Most of the times we don’t even know why, but we can tell there is something in that look. At the same time there should be a clear connection between individual parts of the design. They should be sending the same image message. The cohering elements of an outfit can be present on different levels. Every one of these is a big subject and deserves a topic of its own, so we’ll keep it simple here. -Proportion: consider how to vary placement of garments so they articulate strong message and the outfit has its centre of interest. 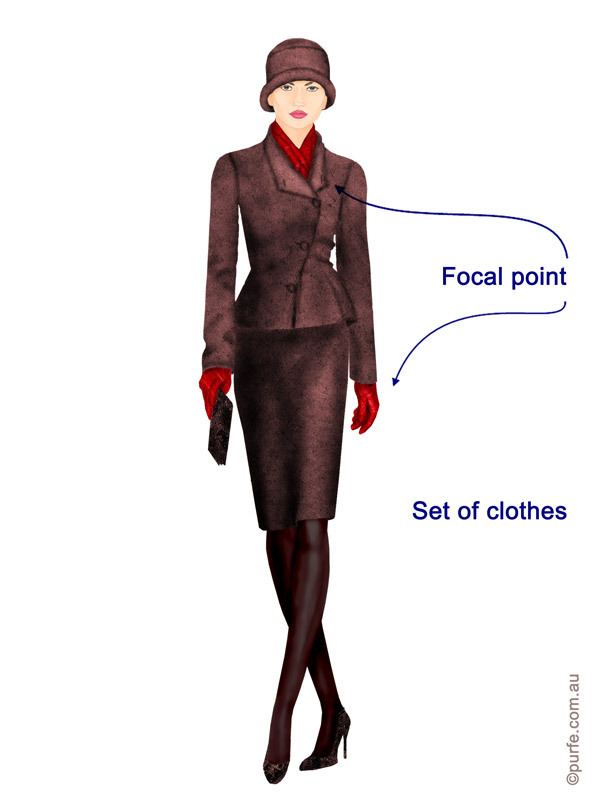 The size of focal point must complement the proportion of the garment (e.g. you might not be the only one who thinks that a big bow on slim evening dress looks ridiculous). -Colour scheme: coherence on this level works best when one accent colour dominates the look and the others work to support and add interest to an outfit. Have another look on that red blouse above. That’s it. 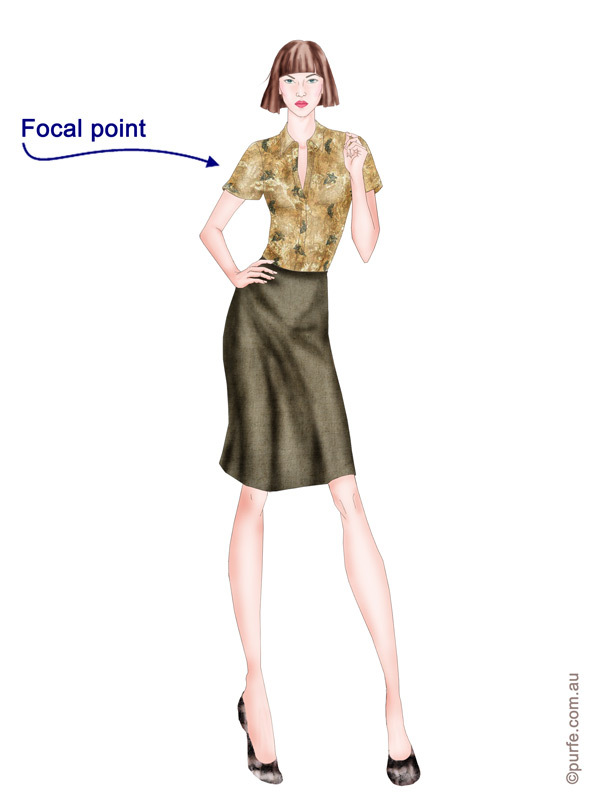 -Shape: sophisticated and irregular shapes cause strong sensory responses so they must be balanced within an outfit to avoid undesirable effect.A decorative blouse with plan paints works well. -Texture: textures influence our mood. We make assumption according to certain textures about age, personality, lifestyle, degree of sophistication. Textures are also perceived according to hierarchy. Smooth and glossy fabrics are catching attention first. -Pattern and decoration: some of them are active and dominant while others are not so strong. Let’s have a look on the example. 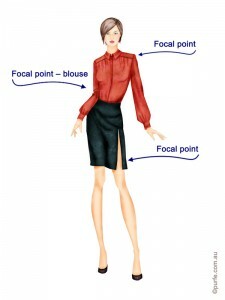 Below, a light patterned shirt is teamed with a plain skirt in matching colour. This outfit is well-adjusted on the levels of colour, pattern and texture. Here all the attracting attributes of each level belong to the shirt and that makes the look balanced. It might be, however, lacking a certain degree of sophistication, but that’s easily corrected by adding accessories. Getting a balanced look is not an easy task as it may seem. But as most of things, you get it with a practice. A good rule of thumb here is: if you are uncertain about something just make it simpler. The safest way to mix clothes in an outfit is to start basic, use one focal point, or one accent. 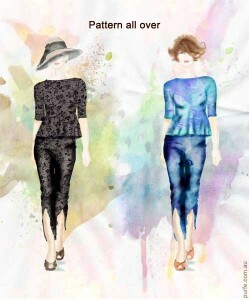 This summer peplum is again on the top of the fashion wave! And according to the fashion weeks taking turns in northern hemisphere this embellishment will be a trend at least one more season. Now it is presented in the most refreshing and outstanding way since its appearance – it is teamed with pants and shorts. I find this tendency to be a great subject for a field study. Close observation of peplum+pants combination on the streets, fashion blogs and catwalk photos lead me to a number of ideas. 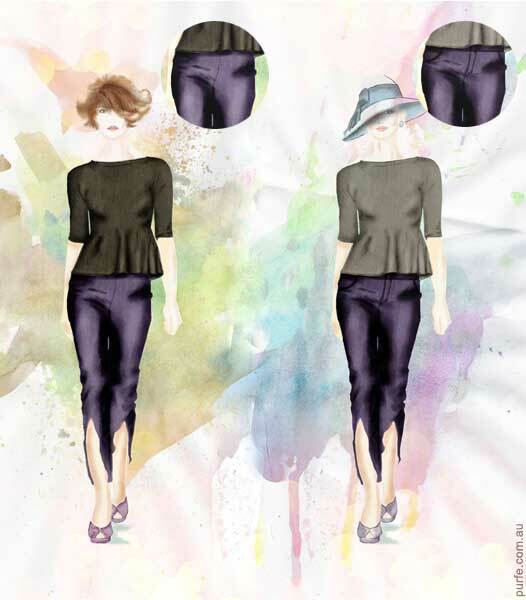 Peplum itself is a dominant feature highlighting the waist-thigh area and pants in their turn are doing the same. So, put together they make lower body the centre of attention. There are several ways to make the look more balanced. Fist way to reduce the number of glances towards the hips would be to wear well-fitted pants without any visible fly-fronts, fasteners, pockets and other distractive details. The minimal number of lines and visible details creates lean appearance. Second option is to use long peplum. This will help to conceal fragile to attention area. Another method to attain a light image is to shift a focal point to the upper body. This can be done by using colour, pattern or accessories. A waist accentuated by peplum and plain top emphasize slim torso and drive attention to other areas. Inverse also works. 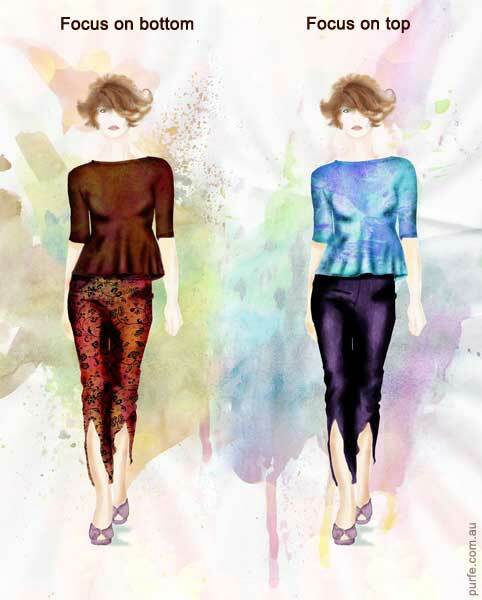 Patterned pants with plain top help to create desired silhouette and disguise lower body. The trick is that decorated surface attracts attention and at the same time provides a camouflage. The right arrangement of decorative motifs and colour blocks become crucial in this situation. And the last, but not the least approach for the graceful peplum look is to use single-colour combination. Add a pattern and we have even more streamlined silhouette. Recently I’ve found a pair of wonderful shoes neglected for a couple of years after unsuccessful attempts to build a look around them. I forgot about them because they are not quite my style – a kind of a variation of men’s classic shoes for women. Nevertheless I decided to give them another chance. 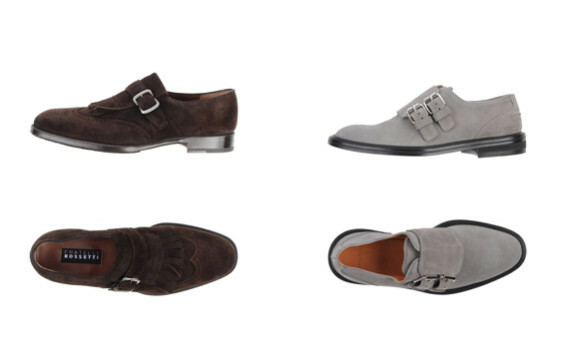 Being convinced that footwear is the staple of one’s look I made meticulous research to classify men’s shoes and figure out what to wear with a particular style. (well, not exactly… The fourth category is slip-on’s, but for the sake of convenience and clarity let’s agree about loafers to be the part of this classification:). Each of them calls for a particular dress style. Now, the most formal shoes are oxford. 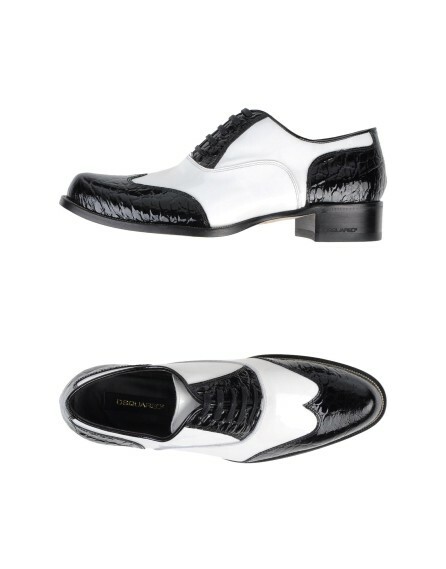 These black patent leather shoes paired with tailcoat equals white tie affairs. For the black tie dress code it is appropriate to put on black leather oxfords with tuxedo. At the less official events derbies and monks are the best choice, whereas loafers are mostly considered as casual footwear. Back to my shoes, they turned out to be derby:) But that’s not the end of the story and shoe classification.